We have discussed the powerful new Wi-Fi Scanner tool in OS X but it turns out there’s a much easier way to access the Wi-Fi Diagnostics app than to dig around in /System/Library/CoreServices/ and make a Dock or LaunchPad alias. Once you’re in Wi-Fi Diagnostics, you’ll want to hit Command+N to bring up the Network Utilities screen which includes the wi-fi stumbler tool, a signal and bandwidth meter, bonjour scanner, and a variety of other useful network tools like ping and traceroute. This is the same for OS X Yosemite, Mavericks, and Mountain Lion. You can also access the various Wi-Fi performance and diagnostics tools through the View menu. 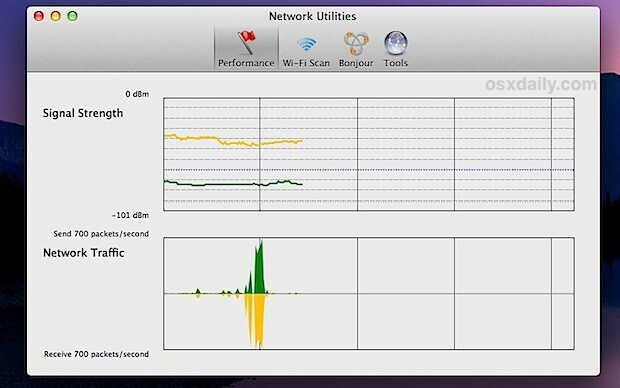 Command+5 will bring up the ever-useful Wi-Fi Performance graphing tool, which can be used to optimize wi-fi network signals and determine signal strength. The performance graph displays signal strength, network traffic, and interference. The longer you let it run the more meaningful you will find the graph data to be. 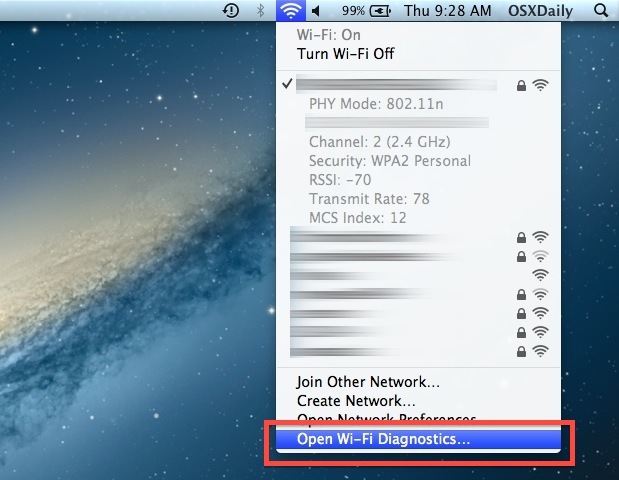 The Wi-Fi Diagnostics app is also in OS X Lion, but the Option+Click shortcut does not work to launch it, and the Lion version does not include the wi-fi network scanner/stumbler portion of the app, making the newest version greatly improved. Awesome tip! That will be handy one day. Same could be done with Bluetooth. Option Click on Blue tooth menu bar icon and you get the option of creating a diagnostic report on the desktop. It appears as a .zip file which extracts as a folder with some diagnostic files. which app do you reccomend using to read the diagnostic files,since some re not text files. Doesn’t work for me either – no options below ‘Open Internet sharing’. iMac 27″ (2010) with Mountain Lion.